Are you acting like a digital steward or a fool? Want to be a good digital steward? Teach yourself and your children digital literacy and manners. That’s my reaction to a new Retrevo study on the lifestyle habits of digitally connected parents that Jennifer Jacobson of Retrevo kindly shared with me. 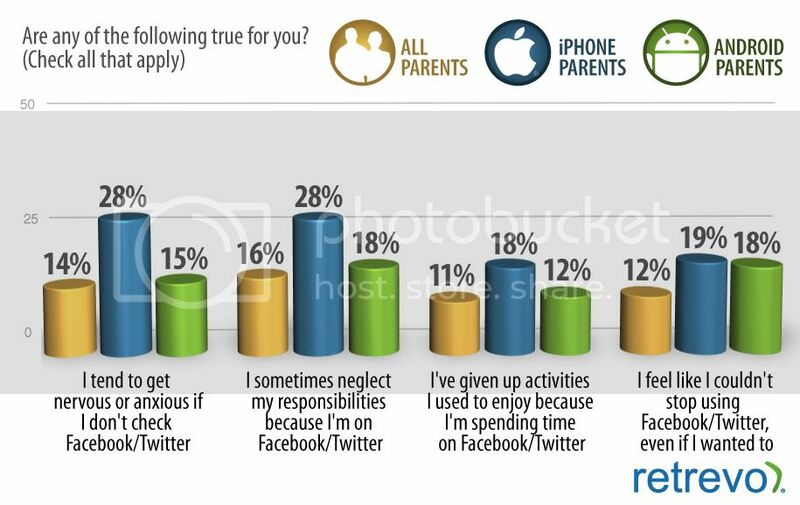 Nearly 20 percent of parents who own iPhones say they’ve given up activities they enjoy in order to spend time on Facebook and Twitter (compared to 11 percent of all parents). Nearly half of parents say they’ve used Facebook to learn about their kids’ friends. I agree that it’s important to understand how kids are using social to interact with each other (the digital bullying phenomenon alone is reason enough). In addition, digital stewards (anyone who interacts with children – both parents and nonparents alike) have an obligation help children embrace the entire digital world – ranging from the devices required to communicate in society to the social media sites that we use to connect with each other. I’m not suggesting you unleash mobile phones on children or allow them to roam free on social media sites without any supervision. But think of mobile phones, iPads, and social media platforms the same way you would your landline phone (if you still use one). At the right time, you teach your child how to use the phone as a communications tool. Digital is no different. The sooner you prepare your child for the digital world, the better. To put your head in the sand is to deny your child an essential skill: digital literacy. 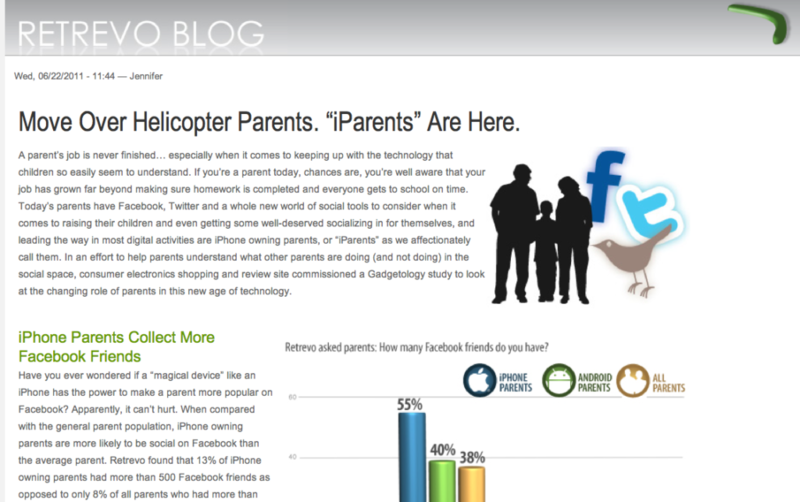 I doubt that less than 20 percent of parents who own iPhones have given up activities they enjoy in order to spend time on Facebook and Twitter. I think the percentage is closer to 100 percent. I suspect many parents participating in the Retrevo study were being less than truthful about this issue. I have blogged before about the addictive nature of personal devices – and I’m the first to admit I’m a prime candidate for a digital intervention. Quite simply, I have acted like a digital fool and continue to catch myself doing so. Digital devices are fun. They are necessary. But digital has its place. Just a week ago, a church service I was attending was interrupted by two phones ringing – one during a child’s baptism. In one case, an adult actually answered his phone and had a brief conversation. And a few weeks ago, my wife (author Janice Deal) had a public reading of her work disrupted by a man in the audience babbling on his mobile phone. Many of us have experienced the embarrassment of our devices beeping or chiming when they are supposed to be turned off. But now we’re at a point where it seems to be OK for us to dive into our digital devices – whether we’re talking on the phone or burying our noses in our iPads – to the point of alienating human beings who share our company. Just do a Google search for “mobile phone rudeness” to appreciate how our misuse of digital has eroded common manners – to say nothing of how we are denying ourselves the enrichment that comes when we give people around us our undivided attention. Or the joy that comes with taking a quiet hike uninterrupted by the buzzing noise of a mobile phone. And, of course, Nicholas Carr has famously commented on how digital is turning us into a society of shallow thinkers who snack on tiny morsels of information and fail to develop the ability to think critically or meaningfully. This entry was posted in Digital, Marketing and tagged Digital, Facebook, iPad, iPhone, Retrevo, social media, Superhype. Bookmark the permalink.